Red leather purse, Vintage jewelry adorned shoulder bag, Crimson Couture Party Purse, Compact mirror on front, OOAK. 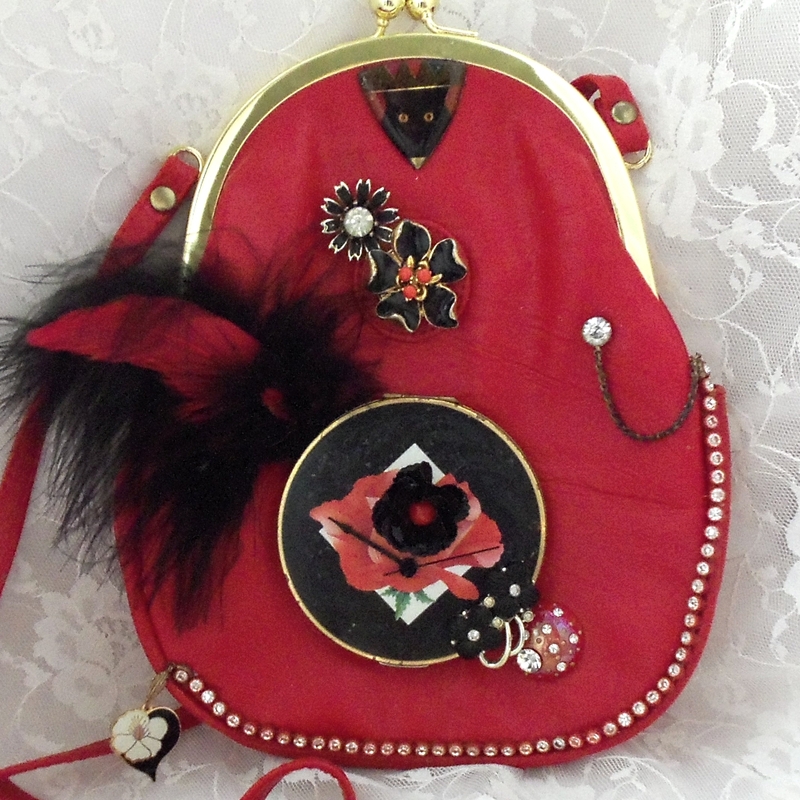 She’s bright with black n red flowers, feathers and a vintage compact mirror. She is always the life of the party, the star of the show, she is Lady Lampanelli and she is an absolute doll. Her bright vintage accessories, like her quick wit, are perfectly arranged. Being the star she is, she keeps her vintage compact mirror close by for quick touch ups. Lady Lampanelli may come on strong, but, upon closer observation you see she really is absolutely lovely. Rhinestones and flowing feathers top her off beautifully. Lady Lampanelli is a true lady through and through and that is why we love her. She measures 7 inches wide by 9.50 inches high and 1.50 inches thick. Her long should strap measures 46 inches long and she is lined in red vinyl with one side zipper pocket. Vintage is always in fashion, never settle for imitation, made to look vintage work, when Marelle can design you your very own true Haute Couture Piece from genuine vintage treasures. No two pieces are ever the same. A La Marelle Couture accessory is absolutely the very best in quality and style. Only One for the One and Only You.